I think we've been making this cookies since we started doing Christmas Cookies. Before our son was born we used regular sour cream. Now we use the soy substitute sour cream. Combine margerine, sour cream, egg, sugar, and vanilla. Stir in baking powder, baking soda, salt, and flour. 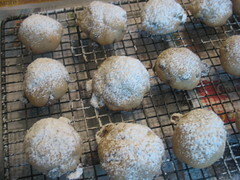 Drop rounded tsp 2 inches apart on lightly greased cookie sheeets.